Salad was an edamame and cabbage mix, which was meh but not terrible. The real disappointment was that the return options were exactly the same! I feel like UA is cutting catering again by having the same mealset systemwide, in both directions. The cumulative meal cuts over the last 12-18 months have me feeling like it might be past time to write a lengthly complain about the overall degradation of F meal quality. If only we could get back to the standards of 2016! 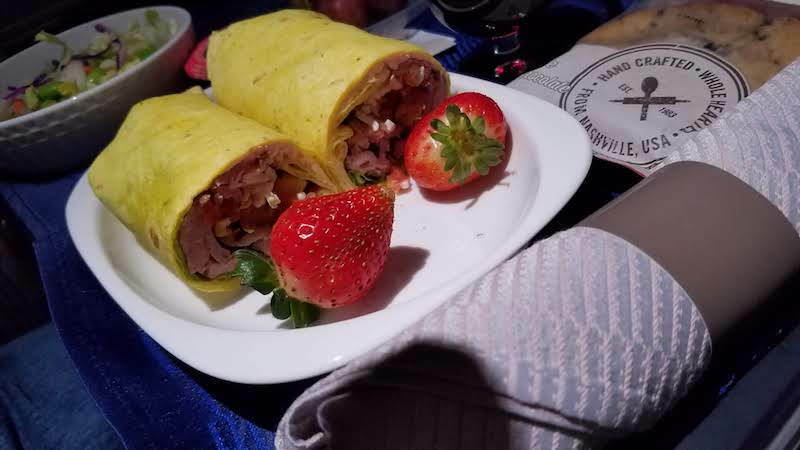 I was on this same flight two weeks ago and also enjoyed the wrap. The breakfast return flight was also good — oatmeal with dried fruits, fruit plate, muffin. They are attempting to multi-sector cater only at hubs in almost all cases now to cut back on costs and reduce turn times. Given the galley space issues this creates on the smaller A/C, they provision the crew meals in bright blue dry ice cooler bags that are placed in the bottom of the closet. I’ve also seen the return of half-size trays in F on some sectors. Hoping this practice doesn’t expand. They are also cutting back on portions as a result - twice this month on SFO-KOA, same meal in both directions. No dessert on the tray at all and the greasy cookie provided before landing, for a five hour flight. Rewind even three months ago and the domestic F dessert was on the tray and the snack basket before arrival. Cuts, cuts. It's disappointing. It's actually been quite a while since I've done a straight out-and-back SFO-WAS trip, but I've heard rumors/reports of SFO-IAD and IAD-SFO having the same two meal choices, which is really just inexcusable. We were a party of 2 on this flight and had pre-ordered special meals; I tried VLML (lacto-ovo veggie meal), my travel companion the Hindu meal. Hindu meal was...edible, although bizarre. It was a bean burrito (maybe intended to be a samosa?) served atop curry rice with a side of plain yogurt and a standard domestic F salad. No bread offered on this tray, although not sure why. Odd meal combination but as I said, at least edible. My VLML was...oh I don't know where to begin. Standard domestic F meal setup (bread, salad and main all on one tray). But the main course...VLML could just as easily mean Vile Meal as Veggie-Lacto Meal. It was tofu, or maybe paneer cheese, with peas in...salty brown sauce, served with a pile of lukewarm rice mush. I have no idea what it was intended to be or what was in the meal. An Asian tofu dish? Indian curry? I cannot say, for the flavor was just pure salt. I honestly don't know if it was tofu or cheese. I had a bite and nearly spat it back out. No snack basket or any form of other beverage offered after meal service concluded. Cookies served close to HNL. Left KOA on-time. Hit pretty significant chop about 30 minutes out which disrupted meal service just as nuts were served. Crew were asked to fasten back into jumpseats and that lasted about 30 minutes. When meal service resumed we were told they had a choice of cheese pasta or beef. Both of us chose cheese pasta which did, fortunately, resemble something like ravioli. I realize these KOA and LIH flights are return-catered in LAX, but I was surprised that no bread or salad was offered. Instead there was a small bread plate with a walnut (one), a dried apricot (one), and two wrapped wedges of cheese plus water crackers. And the other plate contained a wrapped Ghirardelli caramel chocolate. That plus the ravioli was the entire meal, but they did at least offer a snack basket after meal ended. Cookies offered after, but no drink refills beyond water. I realize that UA's Hawaii service doesn't get a premium treatment since it doesn't get a lot of premium traffic, but I would definitely say that DL and AA are a step above service-wise. Both of these flights had the most apathetic crew I've experienced probably all year, across 40-some domestic flights. Exactly the same experience on SFO-KOA return ... no salad and the laughing cow cheese plate. The LAX/SFO-KOA are round trip catered, and the crews go out and back, making for a 12 hour day. They are scheduled 3 or 4 in a row (brutal), meaning the service you get depends on whether it is Day 1 or Day 4! !